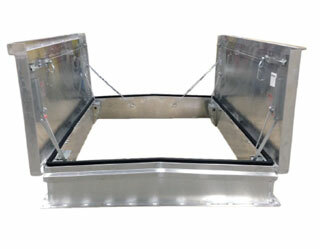 All Steel Construction Personnel Roof Access Hatch, 72" x 60". Cover: covers open easily to 90 degrees. High-strength composite panels with 14 gauge galvanized steel exterior with 22 gauge galvanized steel liner with 1” fiberglass insulation. Curb: 14 gauge galvanized steel with a 12” high curb, integral counterflashing, 3-1/2” wide mounting flanges with pre-drilled holes and 1” exterior fiberboard insulation. Lift Assist: Cover operation is assisted by enclosed heavy-duty Torsion Coil Spring. Latches: Slam latch with interior and exterior handles and padlock hasps.